75 days. Solanum lycopersicum. (F1) Plant produces good yields of 12 oz bright red tomatoes. Perfect for sandwiches, salads, and slicing. This variety is resistant to Tomato Spotted Wilt Virus which is common in the Southern states of the USA. Tomato Spotted Wilt Virus can kill normal tomato plants. Growers in these regions will be able to grow healthy crops using this variety. Suitable for Southern states including: Arkansas, Louisiana, Mississippi, Alabama, Georgia, Florida, South Carolina, and North Carolina. Excellent choice for home gardens and market growers. Disease Resistant: V, FF, St, TMV, TSWV. Determinate. Fusarium Wilt, Race 2, is a world-wide fungal disease that affects the growth of tomatoes. It is one of the most devastating of all soil-borne diseases. Race 2 is found in Arkansas, Florida, New Jersey, and Ohio in the United States. It attacks the roots of the plants and moves up the stems. Symptoms include yellowing and browning of the older bottom leaves, stunting, and wilting. Often the entire plant will die. Usually little or no fruit develops. The infected plants will produce inferior and unmarketable tomatoes. It can cause significant yield loss and even total crops losses. 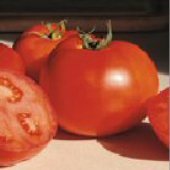 If you stick with Fusarium Wilt Resistant tomato varieties you don’t have to worry. Many of the older heirlooms don’t have any resistance to the disease, so if you grow these then you should keep an eye out for it. The infected plants should be removed and burned to avoid further infestation. Plan on using a 5 to 7 year crop rotation and avoid planting in the same location, year after year, as the disease can survive in the soil up to 10 years. The best option is to use disease resistant varieties. Stemphylium Gray Spot Leaf is a fungal disease that affects the growth of tomatoes. It is found in warm regions of the country, and is common in the Southeastern part of the United States. Symptoms include brown to black specks on leaves. As the lesions grow in size, they develop a gray center surrounded by a yellow area. The spots may dry and fall out, forming a shot hole in the leaf. The disease may cause the entire leaves to turn yellow, then brown, and drop off, and the plant may be stunted. 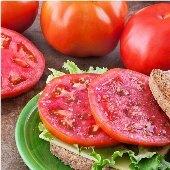 The tomatoes are not usually affected unless there is severe defoliation, where sunburn damage can occur on the tomatoes. 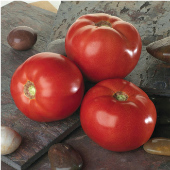 If you stick with Stemphylium Gray Spot Leaf Resistant tomato varieties you don’t have to worry. Many of the older heirlooms don’t have any resistance to the disease, so if you grow these then you should keep an eye out for it. The infected plants should be removed and burned to avoid further infestation. Plan on using a 5 to 7 year crop rotation and avoid planting in the same location, year after year, as the disease can survive in the soil for many years. Stake tomato plants for better circulation. Give plants extra space to allow air to move among leaves to keep leaves as dry as possible. Use soaker hoses and avoid overhead watering. The best option is to use disease resistant varieties. Tobacco Mosaic Virus is a world-wide virus disease that affects the growth of eggplants, peppers, and tomatoes. Tobacco mosaic virus may cause significant losses in the field and in the greenhouse. The virus does not usually kill the plant, but it does cause damage to flowers, leaves, and the tomato. Symptoms include stunted or dwarfed plants, yellow-green mottling, blistering of the leaves, a light-green and dark-green mosaic pattern on the leaves, leaf distortion and curling of the leaves, fernleafing, and reduced growth rate and yields. Blooms may have brown streaks. Pepper plants may have yellow spotting on the leaves. Slightly sunken brown rings will appear on tomatoes. The virus is spread primarily by mechanical methods. The virus is not spread by aphids. Smokers can infect plants by handling them. Gardeners contaminate the plants when they touch tobacco products or infected plants or weeds and spread the virus to healthy plants. The virus can stay alive in dead plant material for long periods of time. It can survive on infected seeds, plant debris, and even clothing for months or years. Tobacco mosaic is one of the most highly persistent tomato diseases because it can remain viable for many years and is able to withstand high heat. The virus can survive for up to 50 years in dried plant debris. The infected plants should be removed and buried or burned to avoid further infestation. Plan on using a 3 year crop rotation and avoid planting in the same location, year after year. Keep your garden weed free. Wash your hands thoroughly and disinfect tools. Try to avoid smoking while working in the garden. Spraying plants with 20 percent nonfat dry milk has been shown to be somewhat effective in preventing the spread of the virus. The best option is to use disease resistant varieties. Tomato Spotted Wilt Virus is a world-wide virus disease that affects the growth of peppers and tomatoes. Symptoms include bronzing of the upper sides of young leaves, which later develop distinct yellow or brown rings. Leaves may curl inward. The plants will be stunted and have dark streaking on stems. The tomatoes will be deformed. 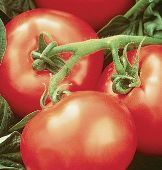 There will be mottled light green rings with raised centers with orange and red discoloration patterns on mature tomatoes making them unmarketable. Infected plants usually wilt and die. It can cause significant yield loss and even total crops losses. The virus is spread by thrips. The disease can stay alive in dead plant material for long periods of time. The infected plants should be removed and destroyed to avoid further infestation. Plan on using a 3 year crop rotation and avoid planting in the same location, year after year. Insecticides for thrips have limited value in controlling the disease as thrips transmit the disease very quickly when they begin to feed on the plant. To control thrips, try setting out yellow or blue colored sticky traps and treat plants with insecticidal soaps. Keep your garden weed free. The best option is to use disease resistant varieties. Picked at first blush and it was a pretty good tasting tomato. I grew it in the Dallas area a couple of years ago and it did well in our heat.